We enjoy a close relationship with the Church of St Philip’s and are lucky to be adjoined to the church; we regularly open the hall doors to create one large spiritual space for children, parents and the larger community to worship both during the school week and on a Sunday. Members of the clergy visit our school each Wednesday to hold worship for our children and staff, in addition to a Eucharist service each half term when we also welcome parents/carers and the local community. Refreshments are available for our visitors following the service. 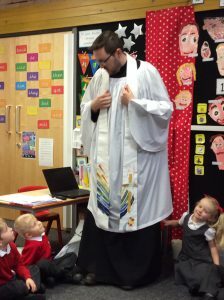 Members of the clergy and church community also hold ‘Open the Book’ worship for Y1 to Y6 children, find out more about Open the Book click here. We also welcome clergy and the church community into classrooms for special Religious Education learning throughout school, in addition to specific preparation for children’s confirmation in Y5 and Y6. The wider church community aslo visit school for ‘Walk Through the Bible’ teaching and learning for Year 5 and Year 6 children, this is based upon the Old Testament. Find out more about St Philip’s Church here.